Most of the world’s solar power, and two-thirds of the United States’, has been developed in just the past two years. The vast majority of new clean energy created between now and 2030 will be from renewables. The increase is largely market-driven, as the cost of renewable energy production has dramatically declined. At the same time, mandates for more renewables are increasing while credible evidence of climate change continues to mount. Many companies have environmental and sustainability policies that commit to reductions in emissions associated with climate change. Minnesota’s community solar legislation and implementing tariffs create an opportunity for corporate partners to play a leading role in a statewide effort to integrate meaningful amounts of solar capacity into the state’s energy mix. Our proposal offers you the ability to source a significant portion of your electric energy demand from solar power and to reduce your carbon intensity, while reducing energy costs and delivering brand value for the company. The 2013 Minnesota Solar Jobs Act authorized the formation of community solar which is now being implemented by Xcel Energy under the Xcel Energy Solar*Rewards Community program. A community solar project (CSP) allows Xcel Energy customers to receive the benefits of solar energy without having to install solar equipment on their roof or property and without it being directly connected into their utility meter. The result is larger, more cost-effective solar facilities that can provide immediate savings on utility costs to participants without any upfront equipment investment by the subscriber. 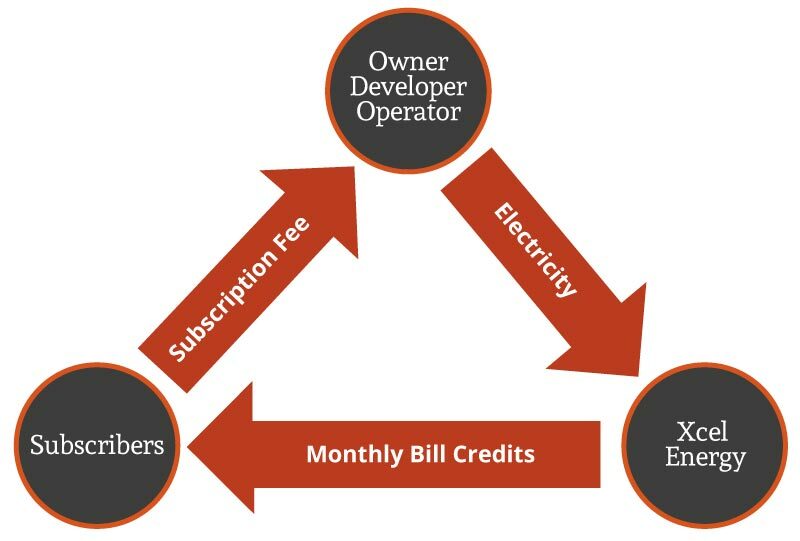 • Subscribers share the output from the CSP in the form of a credit on their monthly utility bills. • Subscribers pay subscription fees in exchange for building and maintaining the system for a period lasting at least 25 years. • Additional subscriber benefits include leadership in sustainability; reduction in corporate carbon intensity; and significant brand value. At TruNorth Solar we have comprehensive knowledge of the solar industry and the regulatory structure in which it operates, allowing our team to capitalize on new and rapidly developing policies to the benefit of our customers and the environment. Inspired by former Medtronic CEO, Bill George, and his book, True North, TruNorth Solar encourages its employees, partners and clients to set their internal compass towards genuine environmental stewardship. Our mission reflects our relentless passion for the stewardship of the planet and our dedication to leadership in creating a better energy future. TruNorth Solar Founder Marty Morud is credited with being a prime mover behind the Minnesota community solar garden law and it’s implementing regulations and tariffs. Marty is trusted by Minnesota regulators, the solar industry community and Xcel Energy. Marty has represented the local solar industry at the Minnesota Public Utilities Commission, testifying often on behalf of garden developers. Michael Kampmeyer and Pat Wier are leading the charge for community solar corporate partnerships.